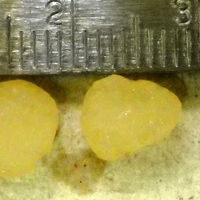 Lee Herold, DVM, DACVECC, explains how a cocker spaniel was treated for bladder stones without surgery. Urohydropropulsion is described in detail and explained step by step how to do it in your own hospital. A three-year-old, 39-pound, spayed Cocker Spaniel was referred for evaluation of a urinary tract obstruction. She had stranguria of several hours in duration. Evaluation at her primary care veterinarian’s office revealed a large, unexpressible urinary bladder. Radiographs were obtained and showed multiple urinary bladder and urethral calculi. She had a history of struvite urolithiasis six months prior that was treated with cystotomy. Stone analysis from her previous surgery was consistent with struvite urolithiasis. The owner did not follow up with dietary recommendations, and the dog was eating an adult maintenance diet. On physical exam, remarkable findings included a large, painful urinary bladder on palpation, and a palpable distal urethral stone noted on rectal exam. An indwelling urinary catheter was passed to relieve urethral obstruction. A radiograph obtained after urinary catheter placement confirmed the presence of multiple <9mm, smooth radio-dense uroliths. 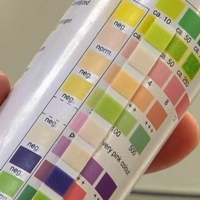 Urine analysis results demonstrated hematuria, pyuria, bacteriuria and struvite crystalluria (Table 1). A urine culture was submitted. Minimal blood work (including electrolytes and renal values) was normal. Based on the size of the stones (relative to the patient) and their smooth appearance on radiographs, voiding urohydropropulsion was offered as an option for nonsurgical removal of uroliths. Despite her previous history of struvite stones, removal was recommended over dissolution in this patient because of her urethral obstruction. The patient was placed under general anesthesia. 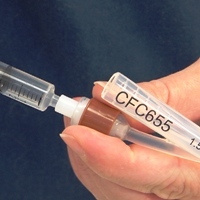 A morphine and lidocaine epidural was placed, and lidocaine was infused into the urethra. Voiding urohydropropulsion was performed by sterile passage of a red, rubber catheter into the urethra and bladder. Saline was infused to distend the urinary bladder. The volume of saline infusion was judged based on palpation of the degree of urinary bladder distension. After urinary bladder distension, the patient was held vertically to promote movement of uroliths into the trigone region. The bladder was expressed with manual pressure for removal of uroliths. Several of the larger uroliths were able to be expressed to the level of the urethral papilla within the vaginal vault, but would not pass further. These larger uroliths were visualized with a vaginal speculum, grasped with alligator forceps and removed. The urethral catheterization procedure, saline infusion and expression were repeated multiple times until no further stones were passed. More than 30 stones were collected; they ranged in size from 2mm to 7mm. Moderate amounts of fine granular stones were voided easily during the hydropropulsion procedure but were not quantitated. A post procedure radiograph revealed successful removal of all radiodense stones. The largest urolith removed was measured at 7mm. The patient was discharged within 12 hours of the voiding urohydropropulsion procedure, with only mild dysuria lasting one day. She was discharged on amoxicillin clavulanic acid (pending culture results) and tramadol for analgesia. A stone analysis was again consistent with 100% struvite uroliths. A urine culture was positive for a Staphylococcus pseudointermedius urinary tract infection with a wide susceptibility pattern. The patient was instructed to complete a three-week course of amoxicillin clavulanic acid with recommendations to re-culture the urine to ensure resolution of infection. She was managed with urinary S/O diet through her primary care veterinarian. The technique for voiding urohydropropulsion has been published and reviewed extensively. Successful urohydropropulsion has been reported in both male and female dogs and cats. The procedure uses gravity to position the uroliths in the trigone for easy removal during forced voiding. With the patient held vertically, the simultaneous manual expression of the urinary bladder causes dilation of the urethra to facilitate voiding of the positioned stones. The appeal of the procedure is that it allows a nonsurgical method of stone removal in patients with repeated urolithiasis but does not require any special equipment or training to perform. Smoother stones tend to pass more readily than irregular or sharp stones. A guideline (Lulich et.al.) for the size of urolith that can be removed with this method is: a smooth stone that is 5 mm in diameter, which can usually be removed via hydropropulsion in a dog weighing more than 18 pounds. In very large dogs vertical or upright positioning of the patient can be facilitated by a tilting the exam or surgical table. The common complications associated with urohydropropulsion are mild and include transient dysuria and hematuria. Incomplete retrieval of uroliths is a potential complication in any procedure for urolith removal, and was reported to happen 28% of the time in a small case series of voiding hydropropulsion. This rate of incomplete retrieval with hydropropulsion is only slightly higher than the incomplete removal rates reported for cystotomy (about 20%). If all stones are not able to be removed via hydropropulsion, then the patient can be converted to surgery immediately. However, an alternative to immediate surgery would be to recover the patient, submit collected stones for analysis and pursue dissolution or surgery at a later date, depending on the stone composition. Urinary bladder rupture is a rare complication of urohydropropulsion and would be an immediate indication to convert to surgery. Urinary bladder rupture is more likely in patients who have been obstructed and had fragile, severely inflamed or devitalized bladder walls as a result. Urohydropropulsion can be useful in dogs who are chronic “stone-formers” with radio-dense stones that are not amenable to dietary or medical dissolution. In these patients, regular radiograph monitoring may be able to detect the stones when they are small enough to be removed via voiding hydropropulsion, thus avoiding repeat cystotomies. Lulich JP, et.al. 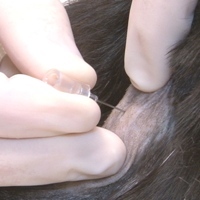 Nonsurgical removal of urocystoliths in dogs and cats by voiding urohydropropulsion. J Am Vet Med Assoc. 1993 Sep 1;203(5):660-3. Lulich JP, et.al. Voiding Urohydropulsion: Lessons from 5 years of experience. Vet Clin North Am Small Anim Pract. 1999 Jan;29(1):283-91. Grant DC, et.al. Frequency of incomplete urolith removal, complications, and diagnostic imaging following cystotomy for removal of uroliths from the lower urinary tract in dogs: 128 cases (1994-2006). J Am Vet Med Assoc. 2010 Apr 1;236(7):763-6. Langston C, et.al. Methods of urolith removal. Compendium on Contin Educ Vet 2010:32(6):E1-8.